This afternoon I was wandering around the Beaches Arts & Crafts Show in Toronto when I noticed some incredible black and white photography that looked very familiar. Two weeks earlier I saw the same photos at Yorkminster Park Gallery in an exhibit titled In the Midst of Angels by Canadian photographer Pamela Williams. Williams was in Kew Gardens this afternoon selling prints of her work and copies of her books. She specializes in European cemetery sculpture which I happen to find very interesting. Many of her photographs are from Cimiterio Staglieno in Genoa, Italy. When I was in Italy last year, one of my regrets was not being able to visit this cemetery which is full of incredible art. I spoke with Williams about her work and learned that some of the cemeteries in Italy require that you ask for permission before you shoot. She also mentioned that the use of tripods is often frowned upon and it’s much easier to use a monopod discretely. Another alternative would be to make sure you have at least one lens in your kit that is equipped with an image stabilizer. When I was in Venice I made a trip to the island cemetery of San Michele and was greeted with signs that said no photography. It didn’t help that I was lugging around a tripod and a large SLR camera. The grounds crew kept a close watch and I was unable to take any photos. Unreal. I ended up purchasing two of Williams’ books – In the Midst of Angels: Photographs of Sculpture from the Cemeteries of Europe And Beyond and Last Kiss: More Photographs of Cemetery Sculpture from Genoa • Vienna • Milan. The quality of the prints in Last Kiss are quite stunning. 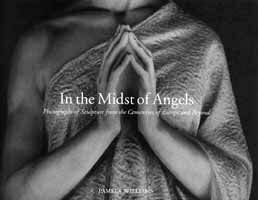 You can view some of the photos from these books on Pamela Williams’ website but the small jpeg images there pale in comparison to the gallery prints I saw. She often lectures and conducts photography workshops. Her Paris Cemeteries workshop caught my eye and would make for an interesting trip.